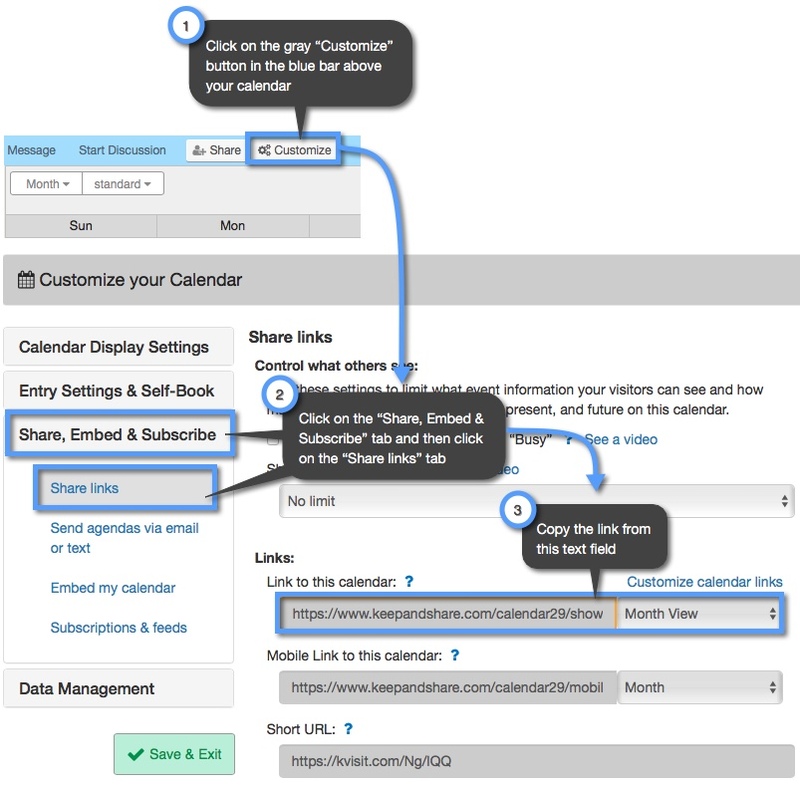 You can link to any calendar in your Keep&Share account using your calendar’s “Customize and Share” screen. The link will be in a text field next to the “Link to this Calendar” text. Not only can you share the links to your calendar, you can also choose what type of calendar view you want to share in your link. You can use a drop-down menu below the text box where you copy your link to choose what type of calendar view you want to share. Be sure that you select your calendar view before you copy your calendar link. The part of the code highlighted in yellow shows the date URL parameter for your calendar. This parameter gets added to your calendar link when you select your calendar view from the drop-down menu where you copy your calendar link. You can also add your date parameter manually. 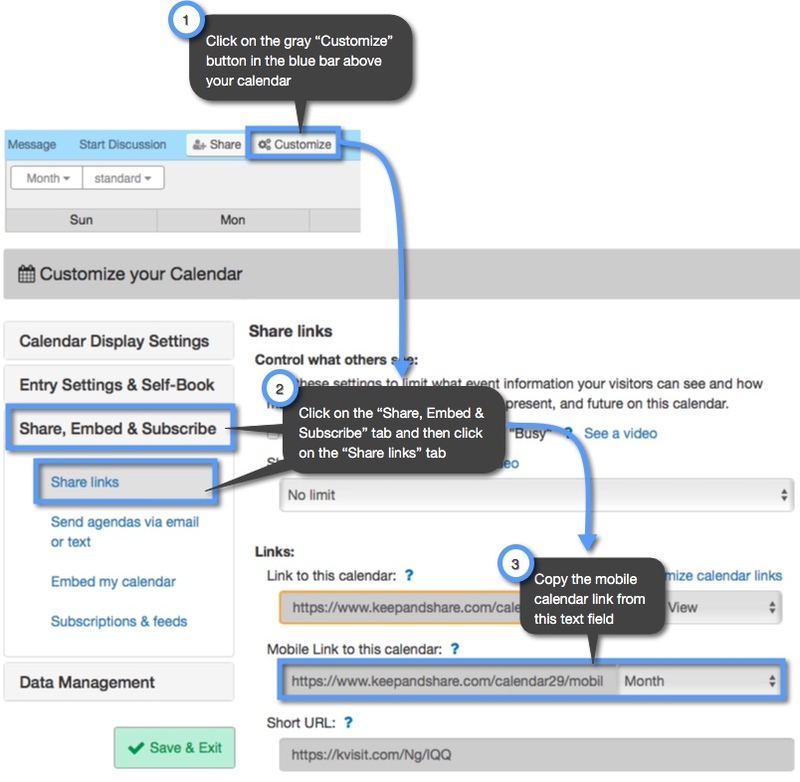 Learn more about adding date parameters to your calendar URL. When you copy the link to your calendar, you will notice that you also have the option of copying a mobile link for your calendar. You can use this link for visitors that you know will be viewing your calendar on a mobile device such as a tablet or a smartphone. The mobile link will make sure that your calendar is being viewed in a format that is compatible with a mobile device. Like with a regular calendar, you can choose the calendar view for your mobile calendar link. Once you select your calendar view, it will automatically be reflected in the mobile link that you copy. Like with the calendar link, the date URL parameter is highlighted in yellow.